Améliorez votre expérience des magnifiques monuments historiques de Cordoue lors d’une visite guidée d’une heure dans la riche ville espagnole. Accompagné d'un guide professionnel, visitez la magnifique mosquée-cathédrale pour vous imprégner des merveilles du monument classé au patrimoine mondial de l'UNESCO. Obtenez un aperçu fascinant de la riche histoire d'un bâtiment déclaré l'un des monuments les plus accomplis de l'architecture mauresque par votre guide professionnel. We loved ALHAMBRA in Granada but we loved MEZQUITA more. 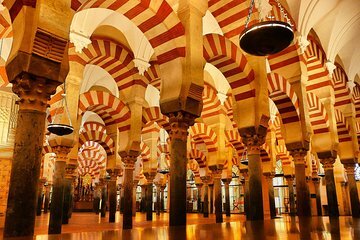 The Mesquita/Cathedral is an awesome place and worth a visit. Our guide was good and we learned lots of interesting facts about the history and architecture. My one issue is that I thought that the tour was a 2 hour tour, but by the time the group got organized in the courtyard, we really were on a tour for under an hour and a half. I'm sure there was much more we could have learned about it even with another 15 minutes of guided tour. Amazing tour!!! Would highly recommend this tour!! This tour was very informative but not well organized. Tour owner was not prepared for all the paying customers who showed up. Tour started 1/2 hr late. Tour guide, Maria Fernanda, was awesome, informative and passionate. I give Maria Fernanda a 5 star as a guide. Tour guide company 3. Getting the tour started and finding our group was really disorganized. Some nice facts from the guide, but finding the group and getting started was a hassle. The tour of La Mezquita was amazing and we had a wonderful knowledgeable guide. The tour moves very quickly as there is so much to see and for the guide to describe in the time we have. It is well worth doing. The mosquita is amazing. Well worth seeing. For us, travelling in Andulusian before Morocco, it was interesting to see such an amazing Islamic built structure and understand the history. A tour is a must but this one was rushed and the guide didn't have a passion for history or architecture.